At the groundbreaking in November 2002, local politicians hailed the planned construction of an Islamic Center by the Islamic Society of Boston as a bridge between Islam and Boston's other religions, the Boston Herald recounted yesterday in the first of a major two-part investigative series. Mayor Thomas M. Menino hailed the center for "creating a space for inter-faith dialog," and thereby bringing "both the Muslim community and the community at large closer together." U.S. Rep. Michael Capuano (Democrat) predicted the center would "help to create a dialogue between Muslims and non-Muslims so we may learn more about each others' traditions." The Boston Redevelopment Authority, a public agency, was no less enthusiastic about the project and sold a 1.9-acre lot to the Islamic Society of Boston for $175,000, or well under the property's market value. The finished Islamic Society of Boston complex, as pictured on the ISB website. Osama M. Kandil, the Islamic Society of Boston's leader for over a decade. Turns out that in addition being a former instructor at Harvard Medical School and the founder and chairman of an Egyptian pharmaceutical company, Biopharm Group, he is also associated with the notorious Safa group of Saudi businesses and "charities" headquartered outside Washington, D.C. and was a founding director of the Muslim Arab Youth Association, one of the most radical Islamist organizations in the United States. Menino and Capuano responded today to the initial revelations, Menino by blowing off the charges ("The Islamic community I know is a good community. Two individuals do not make up a whole community") and Capuano by calling the allegations "pretty serious" and promising "to do my best to learn more." Oct. 31, 2003 update: Rep. Capuano called today on the Department of Treasury to look into the Herald's allegations. To which I say: Bravo to the congressman for taking the matter to heart; and may he and others be more cautious before offering future testimonials. March 8, 2004 update: And bravo to the Boston Herald for sticking with the story of the Islamic Society of Boston's extremism, even when nearly all other media are treating the subject as radioactive. The newspaper just finished a two-part series, running on March 7 and March 8 that details ISB's ties to Yusuf Abdullah al-Qaradawi (quoting his memorable 1995 statement "We will conquer Europe, we will conquer America! Not through [the] sword, but through da'wa") and to Walid Ahmad Fitaihi (who refers to suicide bombings against Israelis as "glad tidings"). Confronted with this information, the major's spokesman weakly reiterated the same line as in October 2003, insisting that the ISB not "be tainted by one or two individuals." Aug. 25, 2004 update: Despite the revelations about the ISB, it continues to receive establishment support – indeed, it may be getting more than ever. If in May 2002, it received $15,000 from the United Way of Massachusetts Bay "to operate classroom-based education programs to raise awareness and acceptance of Islam and Muslims," today it received $100,000 from the National Council on Community and Justice (formerly known as the National Conference of Christian and Jews) "to increase the civic involvement of immigrant Muslim communities in the Greater Boston area." And on July 23, 2004, the ISB received a glowing report from the Pluralism Project at Harvard University. Sep. 29, 2004 update: The Boston Herald reports that James C. Policastro, a Roxbury resident, filed suit yesterday in Suffolk Superior Court against the city of Boston for subsidizing the $22 million Islamic center going up in his neighborhood, the largest Islamic institution in the Northeast. He argues that, in its land deal with the center, the Boston Redevelopment Authority violated two violations of both the state and federal constitutions: it accepted a less-than-fair-market-value price for a parcel of city land and it is illegally supporting a religion. The BRA valued the parcel at $401,187.50. According to the suit, it took a cash payment of $175,000 from the center's developers, then made up the rest of the price tag by valuing at $272,663 a series of benefits the developers are granting Roxbury Community College. For example, the BRA assessed the value of a lecture series the Islamic Society of Boston plans to conduct at the college at $115,598. It assessed the value of an Islamic library of 5,000 volumes slated for the community college at $80,000. Policastro claims the valuations are "substantially inflated," and as a result the city is unconstitutionally subsidizing a religion - Islam. The suit also claims the BRA is ceding "substantial authority" over the library and lecture series to the Islamic Society of Boston. Because Roxbury Community College is a secular and public institution, the suit asserts the arrangement "constitutes state support for a particular sect of Islam." 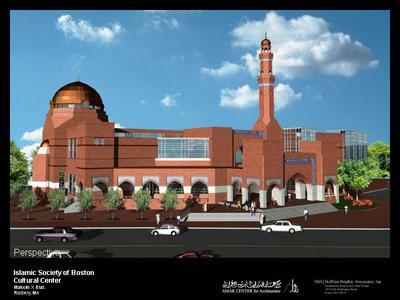 Comment: Is the Boston taxpayer to pay a portion of the mosque building? Will other taxpayers around the country? This case is worth watching, as it could be important in determining whether Islam in the United States is treated like other religions or whether it benefits from the special privileges is customarily receives in Muslim-majority countries. Raising the stakes on a simmering dispute, a group of lawyers, academics and others yesterday urged leaders of the vast new Islamic center going up in Roxbury to disavow the "hateful ideology" of some of the mosque's top backers. "We do not believe the Islamic Society of Boston has been truthful about the center's founders," said lawyer Steven Cohen of Boston. "There are a lot of troubling issues that must be addressed." Oct. 6, 2004 update: The Boston Herald today tells about the "double blow" ISB received today as "an Islamic scholar [Ahmed Subhy Mansour] accused its leaders of tolerating "hateful views" and a city councilor [Jerry P. McDermott] ordered a probe into how the group acquired a choice piece of Hub-owned land at a bargain rate." The Boston Globe adds that another city councilor, James M. Kelly, is demanding to know that the ISB activities do not involve "that element of extremists, who have threatened this country." Oct. 7, 2004 update: The Anti-Defamation League has jumped in the fray, pointing out that ISB's treasurer, Walid A. Fitaihi, has applauded anti-Israeli violence as "a great thing" and made antisemitic statements about Jews having "perpetrated the worst of evils and . . . brought the worst corruptions to the earth." Meanwhile, Mayor Menino has finally acknowledged there may be a problem at ISB, announcing that he asked his staff to look more closely at its associations. And the Boston Herald breaks the news that Muhammad Ali Salaam, called a key fund-raiser for the ISB, also happens to be deputy director of special projects at the Boston Redevelopment Authority, the very agency that agreed to sell the 1.9-acre parcel to the ISB at a less than half its market value. Oct. 11, 2004 update: The Boston Herald asks in an editorial "why an organization that can afford to build a $22 million mosque should be given a cut-rate price on the land it will occupy - land which then will be taken permanently off the city's tax rolls," then raises questions about the mosque's extremism and opines that "city officials, including Mayor Tom Menino, can ill afford to ignore" these matters. I read the writings of Dr. Walid Fitaihi in both the Arabic and the English translations, and found them to be virulently anti-Semitic. It is not a question of "errors in translation from Arabic to English" as Dr. Fitaihi claims. The anti-Semitism exhibited in his writings is the same whether it is in Arabic or English. Dr. Fitaihi's current role in the Islamic Society of Boston raises more questions than it answers, questions that the society needs to answer directly and unequivocally. 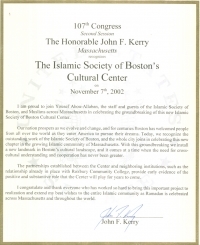 Oct. 13, 2004 update: And speaking of "politicians' red faces" – who should have written a warm letter of congratulations to the Islamic Society of Boston on the occasion of its groundbreaking, dated Nov. 7, 2002, but John Kerry? Oct. 14, 2004 update: The ISB sent a letter to Mayor Menino in which it stated ""We unequivocally condemn all hateful, insensitive, and divisive statements. Furthermore, we have expressed these sentiments to Dr. Fitaihi in writing. ... We regret that previous responses by the ISB with regard to the contentious statements of Dr. Walid Fitaihi have been ambivalent." It also indicated it will create a community relations department to "aid our work in rebuilding relationships that have suffered in the past several months." In response, Citizens for Peace and Tolerance, found the letter to Menino inadequate and listed eight steps the ISB should take "to allay our serious concerns." Condemn Fitaihi anti-Semitic writings and dismiss him from the ISB board. Provide full disclosure of sources of funding for Mosque and related conditions associated with funding. Given the tangled web of financing and multiple layers in which many radical organizations and their associates and founders operate; it is very difficult to determine who really controls certain Muslim institutions. Develop the Mosque Library to be a model for teaching and preaching moderate, tolerant Islam. Radical, hateful literature does not belong in a house of worship. Reject teaching of wife beating. Condemn the teaching and ideology of Alamoudi, Qaradawi. Condemn all suicide bombing as being un-Islamic. Suicide bombing ,any where, against anyone, for any reason is un-Islamic. Make this mosque a model of moderate and tolerant Islam for the nation and the world.. Invite moderate Islamic scholars, as well as Christian and Jews to preach and teach about tolerance. The mosque should be a model of transparency and openness by making its texts, sermons, teaching in both English and Arabic available to the public. Oct. 15, 2004 update: The Boston Globe editors had a long conversation with the ISB leadership, who "suggested that the controversy has roots in both the political radicalism of some of the early members of the mosque and distortions by critics. The point now, they say, is to move ahead and assume a place as a moderating influence and welcoming presence. There is evidence that the Islamic Society of Boston means to do just that." So, for the Globe, the story has come to satisfactory close. Were that only the case for the rest of us. May. 12, 2005 update: The ISB has gone on the offensive, with its chairman, Osama Kandil, filing a suit against the Boston Herald and WFXT-TV, alleging that their news reports in, respectively, October 2003 and November 2004, destroyed his reputation by incorrectly linking him to Islamist terrorists. In the words of the complaint, the two are guilty of "sensationalizing a story that Dr. Kandil ... was linked to radical Islamic terrorists and that both he and the ISB presented a danger to the community." An employee of the BRA Mohamed Ali Salam who was instrumental in making the deal is also a member of the Islamic Society of Boston. He is a major fundraiser for the ISB. This raises a conflict of interest. I believe the official at the BRA acted alone and will be fired. someone at the BRA knew the land was being sold to buyers from Saudi Arabia. The documents for this land transaction were signed by the BRA and mailed to Saudi Arabia and notarized at the US Consulate. The money for the new Mosque has questionable origins. The content of what will be preached at the Mosque is also an area of concern. McDermott stressed that the most important new discovery he made about the sale was its connection to Saudi Arabia. "The biggest area of concern is that the deed was signed and notarized at the U.S. consulate in Saudi Arabia, which is known for practicing one brand of Islam – Wahabism – that's certainly not known to be peaceful." Judging by pictures at an academic website, the cultural center is coming along nicely. Nov. 3, 2005 update: The Advocate reports on two new developments. First, the ISB on Oct. 31 added new names to its May 2005 lawsuit against the Boston Herald and Fox 25 News charging defamation, bringing the total to sixteen institutions and individuals. It is now also suing the David Project, its director of education (Anna Kolodner), the Investigative Project on Terrorism, its director (Steven Emerson), Steven Cohen and Dennis Hale (of Citizens for Peace and Tolerance) and William Sapers (Roxbury Community College). These various individuals and organizations are accused of both defamation and conspiring to violate the ISB's civil rights through "a concerted, well-coordinated effort to deprive the Plaintiffs, who are members of the Boston area Muslim community, of their basic rights of free association and the free exercise of religion." As the Advocate characterizes the complaint, it "alleges an elaborate web of connections between the groups newly named in the suit and Fox 25 News and the Boston Herald, all aimed at undermining the ISB's $22 million mosque and cultural center project under construction in Roxbury. a fundraising event organized by the ISB in October featured Mahdi Bray, the director of the Muslim American Society Freedom Foundation, who has defended Ahmed Omar Abu Ali, the man now facing federal charges of plotting to kill President Bush. Another fundraising event in mid-October featured Salah Soltan, the president of the American Center for Islamic Research, who has stated: "There is no doubt about the fact that the Jews usurped the Holy Lands of Palestine, and it is not permitted to bargain with them over anything except the means of their departure from the lands." For more on Salah Soltan (whose last name is also spelled Sultan), see the extensive discussion of him by Solomonia at "Salah Soltan - A moderate's guest?" Nov. 5, 2005 update: A reader notes an error in the Advocate account, cited just above. Soltan's own website shows him speaking on Oct. 16, 2005 at the Islamic Center of Boston (in Wayland), which is not the same as the Islamic Society of Boston (in Cambridge). But the ISB lists him speaking for it on Feb. 4, 2005, so the mistake is, in all, a minor one. Nov. 18, 2005 update: The Policastro suit filed on Sep. 28, 2004 (see above) can go forward, Suffolk Superior Court Judge Nancy Holtz ruled, denying an ISB motion to dismiss the case. "As a resident taxpayer of the City of Boston, Policastro has the right to contest the sale of publicly owned land at a below-market price to a religious institution for the purposes of operating a house of worship and the endorsement of a particular religion and excessive entanglement created by the establishment of a particular lecture program at a public college." Dec. 9, 2005 update: Critics of the ISB having received a sweetheart land deal from the City of Boston formally requested City Council to review the deal yesterday; in particular, they are citing the July 2005 Department of Treasury statement linking ISB founder Abdurahman Alamoudi with Al-Qaeda. To which, an ISB lawyer, Howard Cooper, replied that "The ISB has had nothing to do with Alamoudi for a long time." In a court filing yesterday, the Herald argued that the ISB seeks to hold the paper and its reporters liable for routine news gathering and reporting on important issues of public interest. The Herald's filing said the ISB and its trustees are "attempting to suppress media inquiry" into controversial issues. The Herald's motion to dismiss also claims that a civil conspiracy claim within the suit is aimed at intimidating freedom of speech. Holding the press liable for reporting on controversial issues "threatens to chill the entire news gathering and reporting process, particularly with respect to highly newsworthy stories on controversial topics," the filing states. In his motion to dismiss, defendant Steven Emerson of the Investigative Project Inc. wrote that the suit "essentially alleges a 'conspiracy' to participate in democracy and to speak freely about a public project." Emerson has investigated and written about national security issues and terrorism for 20 years, and won a George Polk Award for his PBS documentary Jihad in America. "I was surprised that the city of Boston and the BRA appeared to be actively endorsing and entangling itself with a religion," Emerson wrote in an affidavit. "I was concerned that the city of Boston, the BRA and Roxbury Community College did not appear to know about the ISB and its leadership even as those agencies proceed to enter into a long-term relationship with ISB." Gatlin notes that the ISB case is unusual "in that the plaintiffs allege a broad conspiracy involving news organizations, their sources and advocacy groups. That could raise the possibility of more reporters getting sued for 'conspiring' with their sources." This brings to mind the theme I follow at "Islam Driving the Social and Legal Agenda," where I document "the extent to which Islam, not the traditional religions present in the United States, much less other religions new to the country, is driving the social and legal agenda." Dec. 30, 2005 update: In addition to this regular filing on Dec. 23 to have the ISB case dismissed, the defendants filed an Anti-SLAPP motion in Suffolk Superior Court. SLAPP stands for "strategic litigation against public participation" and is a law in several states to protect against lawsuits that would curtail constitutional activities. Massachusetts passed an Anti-SLAPP law in 1994; if the court grants this motion, the ISB would find its suit dismissed and it would have to pay the defendants' legal costs. The ISB now has 60 days, or until Feb. 15, to show that the defendants caused it harm and were not engaged in legitimate activities. Jeffery Robbins, lawyer for the David Project, points out that "It now becomes the burden of the plaintiffs to persuade the court that [what his clients did] is not petitioning activity ... or somehow to show there wasn't a reasonable basis for it." David H. Rich, a lawyer for the ISB and its two top leaders, hinted at the counter-argument when he told the Boston Globe that Robbins's clients do not qualify for legal protection under the Anti-SLAPP statute and cited a September 2004 e-mail from the education director for the David Project, Anna Kolodner, to other defendants. In it, she discussed planning a media campaign and considering a lawsuit that would expose "the radical fundamentalist underpinnings of the Mosque and its leaders." Jan. 5, 2006 update: The Jewish Advocate, a weekly in Boston, has been the locus of dueling full-page ads. On Dec. 23, the ISB placed an open letter: "Like you, we are not perfect. We have among us those who would act in a divisive manner. We understand our obligation not to tolerate this in our community. But when we are the ones who are wronged by intolerance, we need to be able to look to our friends and neighbors to stand up with us and condemn those who are attacking us. . . . We ask you not to buy into the poisoned rhetoric and attacks against our community undertaken by the few extremists who would divide us." The Combined Jewish Philanthropies and the Jewish Community Relations Council of Greater New England responded in today's issue, calling the ISB's defamation suit an attempt "to stifle public discussion and dissuade others from asking legitimate and important questions." It tells how the two groups are "deeply disappointed by the Islamic Society of Boston lawsuit. We stand in solidarity with the David Project and those in our community who have raised these valid concerns and issues and with all those who believe, as we do, that they need to be acknowledged and answered." Jan. 6, 2006 update: The Council on American-Islamic Relations has jumped into the fray with its usual understatement, subtlety, and good sense. "Unfortunately, I see the Boston case as indicative of a growing trend in anti-Muslim rhetoric that has grown after 9/11," said Arsalan Iftikhar, CAIR's legal director. "It has especially impacted local Muslim communities in terms of building their mosques. High concentrations of Muslim populations are being given a hard time for just trying to practice their faith." Mar. 1, 2006 update: Boston's Weekly Dig reveals that the land sold to the ISB for $175,000 had a offer to stop litigation in exchange for private mediation. In a letter to Jewish and Christian leaders, as well as local politicians, Yousef Abou-Allaban, chairman of the ISB's board of directors, wrote that "We are far more interested in peace and harmony than in winning a lawsuit." To which Jeffrey Robbins, an attorney for the defense replied, "There would be a lot of concern that people who have used this tactic of intimidation ... then go to the media and say, 'Look how magnanimous we are. Look how dialogue-prone we are.'" Robbins also noted how the offer suggests the ISB realizes its suit, with its lack of evidence and iner-community strife, is "a terrible thing." To what, ask reporters Paul Mcmorrow and Ted Siefer, "do we owe this sudden devaluation of public land, as well as the BRA's insistence on publicly citing the $401,000 figure? That's anybody's guess. The mayor's press office referred all questions to the BRA's spokeswoman, who failed to acknowledge repeated inquiries." Mar. 3, 2006 update: On the same day that the ISB filed a lengthy response to the defendents' motion to dismiss its defamation suit, the ISB also made an offer to stop litigation in exchange for private mediation. In a letter to Jewish and Christian leaders, as well as local politicians, Yousef Abou-Allaban, chairman of the ISB's board of directors, wrote that "We are far more interested in peace and harmony than in winning a lawsuit." To which Jeffrey Robbins, an attorney for the defense replied, "There would be a lot of concern that people who have used this tactic of intimidation ... then go to the media and say, 'Look how magnanimous we are. Look how dialogue-prone we are.'" Robbins also noted how the offer suggests the ISB realizes its suit, with its lack of evidence and iner-community strife, is "a terrible thing." Mar. 4, 2006 update: Although the Boston Herald broke the news back on Oct. 7, 2004 (see above) that a key fund-raiser for the ISB, Muhammad Ali Salaam, is also deputy director of special projects at the Boston Redevelopment Authority, the agency that sold the land at below market value, this detail has not been the focus of much attention until now. That might change with the publication today of a Boston Globe article, "Aide's role in mosque deal eyed: BRA official raised funds, priced land," by Charles A. Radin and Yvonne Abraham. Relying on BRA documents cited in the two ISB-related lawsuits, they found that Ali-Salaam (as they call him) "played an integral role at key points inside the BRA as the agency gave its approval" to reduce the price the mosque had to pay for the site from $2 million to $175,000. This runs counter to what Ali-Salaam said in an interview in October 2005, when he insisted his activities had always been within guidelines issued by the State Ethics Commission. "When permits and stuff like that had to be done, it was turned over to another" BRA official, he said. He also asserted then that similar deals to that with the mosque have been made with other religious groups, but the BRA has not yet responded to a request to identify these other arrangements. In 2001, Ali-Salaam went further, stating he had not even participated in the decision-making process. In addition, a letter released by the BRA showed a blurring of his roles as city official and mosque promoter. The letter is from the ISB to Roxbury Community College and accompanies a donation of $10,000. The letter is written on BRA stationary and was signed by Ali-Salaam, Abou-Allaban, and Walid Fitaihi, ISB trustees. The donation was sent to the president of the college, Grace Brown, with a request that she not reveal the source of the donation. Finally, Radin and Abraham report that Ali-Salaam "raised funds for the project when he traveled to Abu Dhabi and Dubai in the United Arab Emirates as a representative of the city in 2000. The BRA board gave him permission to make the trip, which was paid for by the Islamic Society, but the BRA spokeswoman, Susan Elsbree, said yesterday that Ali-Salaam was not given permission to raise funds for the project while there." Mar. 8, 2006 update: As a Boston Herald editorial notes, lawsuits are often long, drawn-out affairs and the public needs to know what was behind what it calls the "sweetheart land deal" that BRA gave ISB. It endorses Jerry P. McDermott, a Boston city councilor, who says he's prepared to hold public hearings to find out what happened, how and why land worth more than $2 million was sold for a mere $175,000 and a package of so-called "community benefits." Mar. 9, 2006 update: In its filing last week, the ISB further amended its complaint in a way only reported on now, removing the trustees of the ISB as plaintiffs and adding Ahmed Mansour, an Islamic scholar, as a defendant. Mansour, a political refugee from Egypt, encountered anti-American literature in the ISB mosque and joined Citizens for Peace and Tolerance. Mar. 31, 2006 update: The David Project has provided a data dump of ISB-city relations at "Recently disclosed Boston Redevelopment Authority ("BRA") documents." The eight documents in pdf format, dated between February 1999 and December 2000, consist of letters, memos, and agreements. My favorite is thie 5-page "confidential memorandum" from BRA employee Muhammad Ali Salaam to the ISB board of directors, advising the board how to obtain a favorable response to the ISB proposal, which includes the following sentence (typo included; note the use of "we" and "us"); "Consequently as long as the City feels we working cooperatively and making measured progress, then they will continue to work with us." 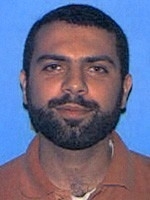 May 10, 2006 update: Ahmed Mansour, the Egyptian scholar of Islam sued by the ISB, has filed an affidavit in response. In it, he suggests that his initial exclusion from the suit "was a deliberate choice to advance the plaintiff's agenda" to portray opposition to the mosque project by Citizens for Peace and Tolerance "as based on some form of religious bias by Christians and Jews." Supporting his claim that the ISB supports Islamist teachings, Mansour submits a booklist from the ISB's library which includes authors who, Mansour says, advocate "killing Muslims who convert ... and who challenge views espoused by Wahhabi imams." He also cites an ISB pamphlet in the Arabic-language claiming a relationship with Yusuf Al-Qaradawi, the Islamist scholar who Mansour says "openly preached the same message of hatred of Jews, intolerance, and violence I struggled against in Egypt." July 4, 2006 update: Prominent Christian and Jewish (but not Muslim) leaders in Boston belonging to the Interreligious Center on Public Life are trying to settle the ISB dispute out of court. Members of the 40-member group include the Rev. Raymond G. Helmick, S.J., Rev. Nick Carter, Rabbi Harold S. Kushner, and Rabbi David M. Gordis. July 6, 2006 update: "Miss Kelly" is on the job and reveals that Salma Kazmi, assistant director of the Islamic Society of Boston, is on the executive committee of the Interreligious Center on Public Life, which has offered to mediate between the ISB and its many self-generated legal opponents. Miss Kelly adds two observations: this connection "might explain how the ICPL got involved in the mediation" and "Perhaps a small conflict of interest here?" Among the documents the BRA did not include in its administrative record was an opinion from the BRA's legal counsel in the early stages of the project warning that discounting the sale price of the land for a religious group could pose constitutional problems. An Ethics Commission opinion also noted that the close involvement of a Muslim BRA official, Muhammad Ali Salaam, could create the appearance that decisions were "unduly influenced by personal loyalties." Other documents indicate that Ali Salaam was intimately involved in many aspects of the deal, traveling to the Middle East on a fund-raising trip with ISB officials and writing letters on behalf of the ISB on BRA stationary. James Policastro's lawyer, Evan Slavitt, called this "a significant step forward." Slavitt even raised the possibility that, should the court invalidate the BRA-ISB transaction, the ISB would "have to tear down the establishment." That is, the three-quarter-finished mosque complex might have to be razed. July 21, 2006 update: And in news of the other case, the defamation suit initiated by ISB, Norfolk Superior Court Judge Janet L. Sanders yesterday denied anti-SLAPP petitions presented by the nine non-media defendants in the suit, indicating it will likely go forward. Aug. 27, 2006 update: The ISB has taken another step to shut down discussion of itself. After Jeffrey Robbins, a defense attorney for the David Project in its lawsuit with the ISB, appeared on the radio talk-show hosted by Michael Graham on station WTTK in mid-August, the ISB subpoenaed WTTK. ISB attorney Howard Cooper justified this step by saying that "the appearance for the lawyer of the David Project on the Graham show is directly relevant to the issues before the court in the pending litigation, and this is why a subpoena has been issued simply asking for copies of the broadcast." Lawyers not involved in the lawsuit disagreed. One, W. Andrew Copenhaver, said he would argue the subpoena is a fishing expedition. ISB, he said, is "trying to curtail legitimate public discussion. They are going to try to punish people for talking about them." Another lawyer, Harvey Silverglate, described the subpoena as "extraordinary," noting that it demands (1) materials used by Graham to support his remarks about the ISB, (2) documents related to Robbins' appearance on the show, and (3) communications between Graham and defendants or attorneys involved in the ISB lawsuit. A manager at the station has said it would provide the ISB with tapes of the broadcast, but not the other materials: "We don't have any of those of things." Aug. 29, 2006 update: Michael Graham writes in his blog that the ISB "has issued a subpoena of my personal phone records, show notes and other materials related to our on air conversations regarding Menino's Mosque. The subpoena came one week after a threatening letter from the ISB's attorney warning me against discussing the issue on the air." Graham also adds: "And, as you heard on my show, my answer to the ISB both times has been 'Kiss My Burkha'." Sep. 10, 2006 update: The ISB legal offensive, issuing two more subpoenas. One went to Tamar Morad, a Waltham-based writer for The New Republic, asking to turn over any communications between her and the lawsuit's defendants concerning the ISB and Osama Kandil and Yousef Abou-Allaban. The other went to the Cambridge-based Christian Broadcasting Corp., demanding that it submit any broadcasts on the ISB, Kandil and Abou-Allaban. Sep. 30, 2006 update: Superior Court Judge Janet L. Sanders rejected the defendants' argument that the case should be dismissed, in part because its actions are protected under the First Amendment and has decided that the plaintiffs' claims should be heard in court. She did, however, dismiss the ISB's charge that statements in the Boston Herald and on Fox 25 (WFXT-TV) placed it in a false light. Oct. 5, 2006 update: The David Project, one of those sued by the ISB, is in turn suing the Boston Redevelopment Authority in Suffolk Superior Court, demanding that BRA produce public records relating to the ISB land deal, and specifically those concerning the actions of BRA Deputy Director Mohammad Ali-Salaam, someone publicly identified by the ISB as one of its principal fundraisers in the Middle East. Oct. 6, 2006 update: Susan Elsbree, spokeswoman for BRA, said the authority is "confident the court will find that the BRA has complied with all public records requests." called upon the Boston Redevelopment Authority ("BRA") and the Islamic Society of Boston to reveal who paid the expenses for BRA Deputy Director Muhammad Ali-Salaam's fundraising trips to the Middle East. Mr. Ali-Salaam, a public employee, was asked by the Islamic Society to travel to the Middle East to help it raise funds for the Islamic Society's mosque project. Deputy Director Ali-Salaam, the official responsible for overseeing the BRA's sale of publicly-owned property to the Islamic Society for construction of a mosque and Islamic cultural center, has also been identified by the Islamic Society as one of its principal fundraisers in the Middle East for the mosque project, even as he was managing the sale of the public asset to the Islamic Society at a price dramatically below fair market value. For more on this step, and how it fits the larger picture, see the excellent blog of "Miss Kelly." Charles Jacobs at a rally. Dec. 17, 2006 update: If your aggressive court case is not going well, try the victimization route; that would seem to be the ISB tactic, judging by the letter from Yousef Abou-Allaban, the Islamic Society of Boston's chairman of the board, to Charles Jacobs, president of the David Project. "We would like to know why you and others at the David Project appear to be so intent on inflaming relations between our communities. Do you really hate us that much?" Abou-Allaban added that ISB members "are aware of your writings in the Jewish Advocate, which we view as essentially rejecting dialogue with Muslims, except those who agree with your political views." But Abou-Allaban notably avoiding answering Jacob's inquiry about ISB fundraising by Mohammad Ali-Salaam. Replying for the David Project, its attorney, Jeffrey Robbins, denied that the David Project is intent to inflame anything. "It is seeking answers to questions that the Islamic society and the BRA continue to dodge. ... Who paid for Mr. Ali-Salaam to spend 10 days in the Middle East raising money for the Islamic society? Who did he solicit? They will not say." At the heart of Boston in Roxbury Crossing stands the magnificent shell of what will eventually be the Islamic Society of Boston's landmark mosque, as yet incomplete. Progress is swamped by the well-publicized accusations of the David Project, a Jewish advocacy group, about the mosque's funding and leadership and the ensuing litigation against the David Project by the Islamic Society of Boston. Meanwhile, Jewish-Muslim relations in Boston have become tense, undermining honest and difficult dialogue at the very time we need it most. Last month, as I stood under the great dome of the mosque at Roxbury Crossing, I prayed, as a Christian, for its speedy completion. In 2006, it should not surprise us to learn that the so-called "Islamic world" is not somewhere else. Boston is part of the Islamic world. Looking to the future, the vision of an Islamic Center dedicated to interfaith outreach and education at the crossroads of Boston is worth the commitment of Christians, Jews, and Muslims. Comment: Just to point out the glaring mistake here, progress at the ISB is not "swamped" by the David Project but by the ISB's own affiliations, statements, and actions, including its lawsuit versus the David Project. Dec. 30, 2006 update: The presidents of two prominent Boston-area religious institutions, Nick Carter , president of Andover Newton Theological School, and David Gordis, president of Hebrew College, sent a joint letter to the ISB and the David Project. The Boston Globe reports it appeals to the two parties to drop their respective lawsuits, issue a joint statement condemning terrorism, declare their shared support for the construction of houses of worship, support the creation of a new center for interfaith understanding, and that they hold a joint "celebratory event." "We don't mind being called naive, but there's a simplicity about this that tries to say to each of them that we think this is something worthy of your consideration—it's a chance for peace to break out," Carter said. "It has rarely produced productive results to try and go back and find out who was to blame. Sometimes it's easier to try and listen carefully to what each is trying to say." Gordis added: "we think that this business of trading lawsuits is really not the way to deal with issues like this." "We embrace the proposal. ... We want to immediately begin the process of healing these rifts," said Jessica Masse of the ISB. Comments: (1) Is this another indication that the ISB regrets its rush to the courtroom? (2) The Carter-Gordis letter offers a crystalline example of moral equivalence. (3) It's lucky that Carter and Gordis don't mind being called naïve, for that well describes what they are. Real issues are at stake here – including freedom of speech and separation of church and state; singing Kumbaya together does not solve them but only delays their resolution. Jan. 10, 2007 update: The ISB has acknowledged receiving at least $1 million in financing from the Islamic Development Bank in late 2005, report Charles A. Radin and Stephen Kurkjian of the Boston Globe. The bank, based in Saudi Arabia, is owned primarily by the governments of Saudi Arabia, Libya, Iran, and Egypt. Jan. 23, 2007 update: The Boston Redevelopment Authority argued in Suffolk Superior Court yesterday that four of its key officials need not answer questions under oath about the ISB deal, as demanded by the David Project, being Robert Tumposky, deputy director for management information systems; Muhammad Ali-Salaam, deputy director for special projects; Patraap Patrose, deputy director for urban design; and Kevin Morrison, the agency's general counsel. This requires some knowledge about Islam. For Muslims, obtaining interest-free (sharia-compliant) funding is a religious mandate. Therefore, traditional funding has not been an option. With donations trickling to a halt because of unscrupulous charges of ties to radicalism by groups in opposition to the mosque, the society was compelled to seek assistance funding the partially built structure. Feb. 19, 2007 update: The David Project announced today that ISB has for the second time served a subpoena on the Anti Defamation League. Feb. 25, 2007 update: James C. Policastro sued the Boston Redevelopment Authority on Sep. 28, 2004 (see above) for violating the constitutional separation between religion and state when it sold a parcel of land to the ISB at far below its appraised price; Judge Sandra L. Hamlin of Suffolk Superior Court has now dismissed Policastro's suit, ruling that he lacks legal standing to challenge it, having failed to file his lawsuit within 30 days of the sale, the period of time the Massachusetts Legislature has set as the deadline for appealing BRA's decisions. (Policastro filed more than 16 months after the sale.) Hamlin rejected Policastro's argument that he should be afforded the court's customary three-year period to bring the suit, given that he was contesting the agency's decision on constitutional grounds. Jessica Masse, the ISB's interfaith coordinator, indicated that about $12 million has been spent on the mosque project so far, with the society hoping to raise another $2 million to complete construction of the mosque and part of the school by September 2007.
the Islamic Society of Boston has been the target of a smear campaign which strives to undermine and disrupt their constitutional rights to assemble freely to worship as they choose. This effort on behalf of the defendants is a challenge to American Muslims in a campaign to hinder the integration of the American Muslim community into mainstream American society. Mar. 15, 2007 update: The ISB is the beneficiary of an affidavit by John Esposito of Georgetown University. He says that the defendants "misleadingly attempt to suggest a link" between the ISB and Wahhabism. Mar. 25, 2007 update: Whoops. In "Uncovered Document Shows: Islamic Society of Boston Lawsuit a Sham," Solomania reports on an ISB e-mail dated July 18, 2005, claims that "Fundraising has been robust." This directly contradicts the ISB's first amended complaint, dated March 3, 2006, where it states that its critics had undermined its fundraising capabilities. Or, to quote pp. 2-3, paragraph 3 of the complaint, "In the wake of the Defendants' attack, donations to the ISB have decreased." Apr. 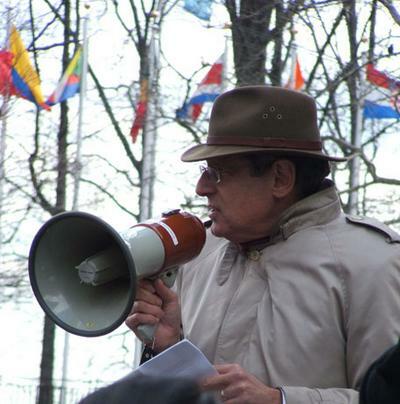 9, 2007 update: Boston's Jewish Advocate reports that Walid Ahmad Fitaihi, longtime director for the ISB, met privately with a Jewish group of about 25 persons on April 6 and apologized for his past statements about Jews. According to one participant, Michael Felsen, Fitaihi "recognized that there were wounds in both directions, to both the Jewish and Muslim communities, and he came with the stated desire to begin to heal the wounds caused by some of his words." Fitaihi, chairman of the board and chief executive officer at the International Medical Center in Jeddah, Saudi Arabia, was briefly in the United States and left the country two days later. Apr. 10, 2007 update: "Miss Kelly" helpfully recalls that the wounds inflicted by Fitaihi were in part caused by his "engaging in local interfaith dialogue at the exact same time as he made his comments in Arabic newspapers. ... His comments included applauding anti-Israeli violence as 'a great thing,' and statements about Jews having 'perpetrated the worst of evils and ... brought the worst corruptions to the earth'." She adds that Fitaihi is not alone in living outside the United States: "My understanding is that all [ISB] trustees reside overseas (KSA, UAE, Qatar) at this time. None reside in the U.S., let alone in Massachusetts." We don't have any wording from the "apology," nor do we know who, exactly, was at the meeting. How do we measure this? Fitaihi jetted into town, then just as quickly jetted out after facing what looks like a friendly audience and no serious or skeptical questioning—a group who then ... surprise ... pronounce him absolved. Apr. 12, 2007 update: The vigilant "Miss Kelly" notes that the ISB's board of trustees is half the size of what it used to be: "First there were six Islamic Society of Boston (ISB) trustees... Jamal Hafiz resigned and then there were five. Mohammad Attawia was removed, and then there were four. Walid Fitaihi resigned, and then there were only three trustees. It's the Incredible Shrinking Board of Trustees!" She also delves into the odd practices of the ISB board of trustees. BRA spokeswoman Susan Elsbree indicated that the agency would turn the documents over within two weeks; she also responded with a preposterous statement, about The David Project stirring up negative media attention about the documents' contents. "Every time they breathe, they make a press release out of nothing. We think this is a good project." To which The David Project's lawyer, Jeffrey Robbins, replied: "This isn't a matter about public relations or press conferences. It is a matter of citizens imploring a public agency to obey the law and give the public what it is entitled to." Apr. 16, 2007 update: Back to the "Incredible Shrinking Board of Trustees": "Miss Kelly" notes that Ali Yusuf Tobah resigned, bringing the number down to two, but then Jamal Badawi joined the board, returning its number to three. Apr. 25, 2007 update: Jeff Jacoby turns up another interesting discrepancy in the ISB's record. Writing in a Boston Globe column, "New Questions For The Islamic Society," he finds an inconsistency with the ISB's claim to have had no connection with Abdurahman Alamoudi. The ISB's founder in 1982. During the 1990s, one of Washington's most accomplished and high-profile Islamist figures. Someone who, according to the U.S. Department of the Treasury, had "a close relationship" with Al-Qaeda" and raised $1 million for it in 2003. A prisoner serving a 23-year sentence after having pleaded guilty to terrorism-related crimes and admitted plotting with Muammar Qaddafi to assassinate then-Crown Prince Abdullah of Saudi Arabia. Not surprisingly, since it became a topic of controversy in 2003, the ISB has repeatedly distanced itself from its founder. ISB lawyer Albert Farrah said in 2003 that Alamoudi "has had no role in, or affiliation with, the ISB for approximately 20 years." A statement on the ISB website asserts that "Alamoudi left Boston in 1984 and has had no contact with the Islamic Society of Boston since that time." The chairman of the ISB board, Yousef Abou-Allaban, claims in an affidavit that "since at least 1992, the date I first became involved with the ISB, Mr. Alamoudi has had no role or relationship with the ISB." Salma Kazmi, a former assistant director, adds that "when Mr. Alamoudi pled guilty to criminal activity in 2004, he had not had any relationship with the ISB for years." An ISB attorney in its lawsuit, Howard Cooper, has rejected any link. "This man has had absolutely no connection with the Islamic Society for 15 or 20 years." But Jacoby reveals that the ISB paid Alamoudi for one or more speaking engagements between November 10-12, 2000. The cancelled check, made payable to Light Star Travel and signed by former ISB trustee Walid Fitaihi, includes a memo line reading "Travel for speaker Abdurahman Alamoudi -- 11/10/00 - 11/12/00." Jacoby inquired of the ISB about this and other issues recently in the news, to which he got this reply from its spokeswoman Jessica Masse: such questions "do not reflect a position of unbiased fact finding." She also said the issues would only be dealt with "by our lawyers in court." Mr. Alamoudi left Boston in the 1980s and did not thereafter have any meaningful role with the ISB. He was not a director. He was not a trustee. He did not influence our thinking. And, of course, we had no role in anything he did that caused him to be arrested years after he left Boston. The ISB has canvassed the directors and trustees who remain associated with the ISB about the speaking engagement referred to in the memo section of the check given by the defendants to Mr. Jacoby. Uniformly, they have no memory of Mr. Alamoudi speaking at the ISB or the ISB sponsoring him to speak elsewhere. We do note that from time to time the ISB is asked to help facilitate speakers who come to Boston by helping with their expenses. In 2000, Mr. Alamoudi was a person of prominence who was invited to speak regularly before many groups. It is possible that this is what happened here. There is also more breaking ISB news from the Boston Globe today; Donovan Slack reports from Boston Redevelopment Authority documents (in "BRA official asked help from mosque backer: Pushed for mayoral visit to Mideast during talks") that BRA's deputy director for special projects, Muhammad Ali-Salaam, wrote to Esam Mudeer, a Saudi television executive and supporter of the ISB project, to help plan a trip to the Middle East for Mayor Thomas M. Menino and several of his political allies (BRA chairman Clarence Jones, BRA board member Joseph Nigro, BRA director Thomas O'Brien, Senator Dianne Wilkerson, Representative Gloria Fox, plus Ali-Salaam himself) shortly after Mudeer had met with Menino in Boston in 1998 to discuss the mosque. "Wouldn't this be a fitting way to express our gratitude for their support and encouragement?" Ali-Salaam wrote to Mudeer on BRA letterhead. The trip did not take place but, as the Globe notes, it "raises new questions about Ali-Salaam's role on the project, as well as his relationship with the Islamic Society and outside advocates of the mosque while he negotiated a land deal on behalf of Boston taxpayers." BRA officials have insisted that Ali-Salaam has been in "full-compliance with conflict of interest law and state ethics standards" in his work on the mosque project and that he kept agency officials informed of his activities. But state conflict of interest law, the article goes on, "prohibits public officials from seeking or personally receiving anything valued at $50 or more if it is being given to influence a present act, induce a future act, or reward a past act, according to State Ethics Commission guidelines. The law also prohibits officials from engaging in activities that create the appearance of a conflict of interest, unless they disclose potential conflicts to their appointing authorities." newly released documents also include correspondence between Ali-Salaam and Islamic Society officials, in which the BRA official counsels the society on how to negotiate with his agency to get the best deal in their effort to build a mosque, Islamic cultural center, and school on a 45,000-square-foot parcel in Roxbury Crossing. In one memorandum, marked "confidential" dated Sept. 22, 1989, Ali-Salaam tells Islamic Society trustees that the BRA sold a Roxbury parcel to the US Postal Service several years earlier for $16 per square foot, but he advised the trustees that a Bank of Kuwait appraisal of the potential society land put the value at $6.50 per square foot. He advised the society that the lower figure could be used when negotiating a purchase and said the purchase price could be reduced further by adding community benefits to the project. Masse says this all looks just fine to her. "He was a public servant helping the public, in this case, an Islamic organization, work through a bureaucratic process." While I believe that neither the religion of Islam, nor the collective loyalties of the sponsors of the Cultural Center to the Constitution of the United States are being called into question, I must acknowledge the existence of individuals [both internal and external] who may be determined to undermine the public's confidence in the Project. Further, and this is also being made available for the first time here, liberal Congressman Michael E. Capuano, immediately after the publication of the Herald series (the facts of which have never been in question), sent letters to ISB board chairman Abou-Allaban, and to Juan Carlos Zarate, Deputy Assistant Secretary, Exec. Office of the Terrorist Financing and Financial Crime of the US Department of the Treasury. He asks the Treasury Department to open an investigation into the allegations, and he advises Abou-Allaban to cooperate with the investigation and "respond publicly to each and every one of these allegations." Capuano is clearly alarmed by the charges, as any reasonable person would be, and starts demanding answers. Capuano remains off the defendant list, yet ordinary citizens who share the same concerns have not been so lucky. Also today, Miss Kelly posts no less than thirteen documents dating from 1992 to substantiate her title question, "ISB and BRA's Muhammad Ali-Salaam - Slight Conflict of Interest?" May 29, 2007 update: The ISB has unconditionally and completely dropped its lawsuit against all 17 defendants it sued in 2005, without any payment or other benefits in return. Amusingly, it has the gall to claim this on its website as a "major victory." Comments: (1) It would appear that the accumulating evidence about ISB activities made going forward, even on a predatory basis, counterproductive. (2) What a great day for American justice and freedom of speech. June 5, 2007 update: I interpret the ISB lawsuit in an article today, "Islamists in the Courtroom." What the lawsuit was really about, it seems to me, was intimidation—intimidation of anyone inclined to raise questions or express concerns about the Islamic Society's leaders and their connections to radical Islam. Libel suits have become a favorite tactic of Islamists, who deploy them to silence their critics. In yet another document produced during discovery, the head of the Islamic Center of New England advises Abou-allaban to "thwart" Fox 25 with a lawsuit. "If Fox is being sued for this story," he writes, "it stands to reason that they will be prevented from reporting on the story further while the case is in court." Sad to say, such legal intimidation works. Once the lawsuit was filed, Fox 25 and the [Boston] Herald essentially ended their investigative reporting into the Islamic Society's radical connections. Others felt the pressure, too. When an attorney for one of the defendants was interviewed about the case on the radio, the station received a threatening legal letter from the Islamic Society's lawyer—followed by a subpoena for tapes of the interview and the program host's notes. A free-lance journalist who wrote an article about the case for The New Republic was likewise hit with a subpoena. Aug. 29, 2007 update: Walid Fitaihi is a Saudi who was an original ISB trustee and deeply involved in ISB's mosque project; he resigned from the board and left the United States when his anti-Semitic writings caught up with him – see the many mentions of him in this weblog entry for details. Well, Solomonia announces that, with the lawsuit over, Fitaihi has returned to the ISB board. no major Boston media outlet took note of Fitaihi's departure and return earlier this year. (Only two local conservative blogs, Solomonia and Miss Kelly — solomonia.com and misskelly.typepad.com, respectively — seemed to notice.) What's more, a conciliatory meeting Fitaihi had with a group of Jewish leaders in April was covered only by the Jewish Advocate. None of these developments has an unambiguous meaning; what you make of them depends, in all likelihood, on whether your sympathies lie with the ISB or its detractors. But there's one unifying thread: reporting on anything that involves Fitaihi would require explaining why, exactly, he's a significant figure. And this, in turn, would have meant delving into some of the same details that helped put the Herald and WFXT on the receiving end of a lawsuit. Which brings us to the heart of the matter: has the Boston press decided that aggressively covering the ISB is too risky? The answer, according to [Boston] Herald editor Kevin Convey, is "No" — but there's an asterisk. "When we were involved in the suit," Convey tells the Phoenix, "we were very, very careful about what we reported, for obvious reasons, and we really haven't gotten into the swing of keeping an eye on it. It isn't like there's any policy, spoken or unspoken, not to cover the subject. We just haven't done it." But, Convey adds: "I don't think anybody in the business would deny that major lawsuits . . . can have a chilling effect — not only on us, but on other people, as well." The [Boston] Globe stayed on the ISB story even after the October 2005 lawsuit, paying particularly close attention to irregularities involving the ISB's purchase of city land. But since the ISB's suit was dropped in May, the Globe's coverage has tapered off. ... According to Globe metro editor Brian McGrory, it would be a mistake to read too much into this. "We covered the lawsuit very aggressively," he says. "We didn't back off on that at all. From what we've seen, there haven't been any major news developments. We've dedicated a lot of resources in the past to looking at issues around the ISB. . . . Any perceived lack of news coverage . . . is only the result of a lack of news." Reilly asked ISB spokesman Bilal Kaleem: "Had the threat of litigation changed the way the Boston media covered the ISB?" To which Kaleem replied, "I hope so." I guess black really is white and day really is night today. From whence this notion of giving a leadership award to someone who should have been investigated - if not prosecuted - for a flagrant conflict of interest on the Boston mosque project? July 24, 2008 update: A reader, the producer of L'Afrique (lafrique.com), was surprised to see that the Roxbury Crossing station of the Boston area subway system sports a painting of the nearby Islamic Society of Boston mosque and other Islamic themes. He sent me pictures of the still-unfinished mural and its surroundings, one of which I reproduce here. (For the others, click here, here, here, here, and here). 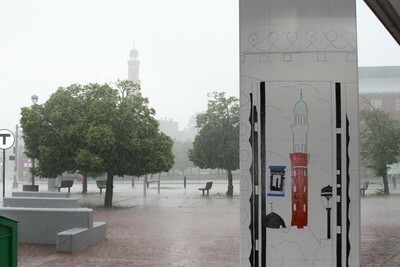 The Islamic Society of Boston mosque in the background, a Massachusetts Bay Transportation Authority mural depicting it in the foreground. Comment: As the photographer points out, the Boston public transportation system does not sport crosses, stars of David, or other religious insignia. How did this exception come about? One hopes that Bostonians are not so beat down by ISB litigiousness that they have lost all curiosity about that institution's activities. Sep. 15, 2008 update: The ISB has opened for worship. The David Project has sued the BRA, alleging that it has withheld records that are subject to the Freedom of Information Act. This action is ongoing. The BRA has told the judge trying the case that all relevant e-mails have disappeared. Meanwhile, the mosque has reinstated to its board a man [Walid Fitaihi] whose anti-Semitic statements led to enormous public pressure for his resignation. The Phoenix has learned that, subsequent to his reappointment, that man donated $250,000 to the mosque. Dec. 3, 2008 update: Citizens for Peace and Tolerance, which has been on the ISB case for years, issued a meaty press release today, "Texas Terrorism Trial Ties Boston Mosque Leaders to Extremist Network," that looks in detail at ties between three of the ISB leadership (Hossam Al Jabri, Jamal Badawi, and Osama Kandil) and the Holy Land Foundation, which, along with five of its organizers, was just convicted for sending more than $12 million to Hamas. Dec. 10, 2008 update: The Phoenix published a lengthy and well-informed editorial today, "Menino's mosque II," in which dwells on the double role of Muhammad Ali-Salaam and asks some tough questions about his playing both sides against the middle. Abdurahman Alamoudi, the mosque's founder and first president who in 2004 was sentenced to 23 years in prison for plotting terrorism. In 2005, the Treasury Department issued a statement saying Alamoudi raised money for al Qaeda in the US. Tamerlan Tsarnaev and Dzhokhar Tsarnaev, the Boston Marathon bombers who attended the ISB's Cambridge mosque. Ahmad Abousamra, the latest: a top propagandist for ISIS. Again and again, the ISB leadership dismisses the problem as bad apples and unhappy coincidence. But, as Sperry asks, "how many terrorists does it take before people are convinced it isn't a coincidence?" July 26, 2015 update: For another review of the Islamist penumbra around the ICB, see "Moderate imam reveals how radicals won battle for soul of Boston mosques" by Brooke Singman at FoxNews.com.